We're still trying to figure out how this happened, but for January both winners were chosen from the Yarn Department entries. 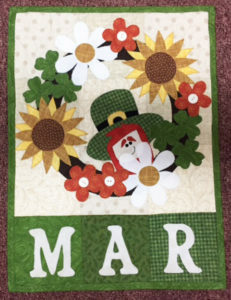 So for February, both winners will be chosen from Quilt Department entries. Sorry for the mix-up. In March we'll make sure there is one winner from each area. 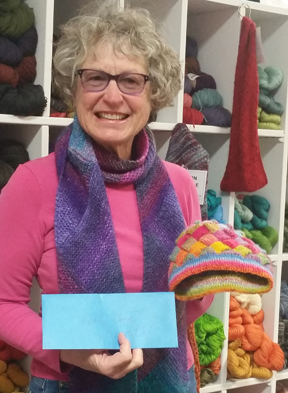 Our two winners of $50 gift certificates for January were Pasty Coen (picture above with her completed projects) and Tiny Higman (pictured here on Sit & Stitch Friday). Congratulations to them both! For our staff drawing, Anne Worthington was the winner. 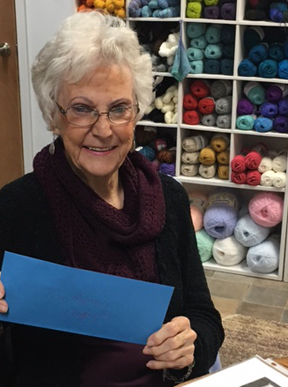 Cortez Quilt Company & Yarn Shop has donated $100 in Anne's name to her favorite local non-profit organization. 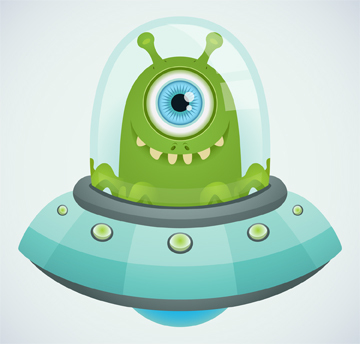 Register up to three new UFOs by this Friday at 6 p.m. and you'll have until the end of the month to get them done and be entered to win a $50 gift certificate. Full details on our home page. These colorful spring panels tell a story. Look closely and you'll see it. 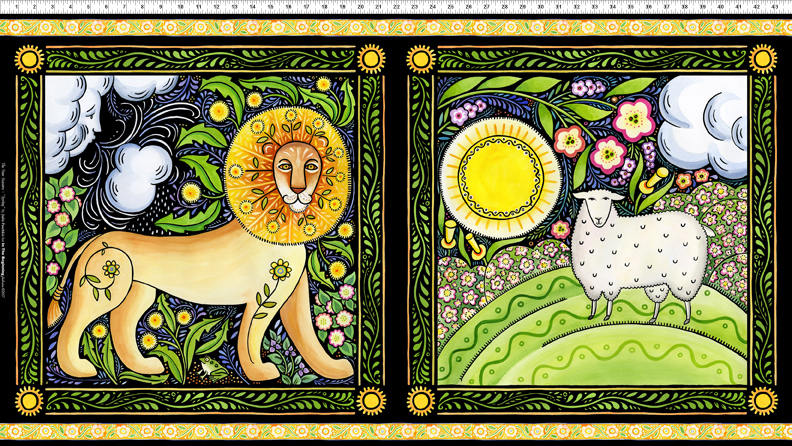 This panel include both images and they are about 21" x 21" each. We're making a big pillow out of one and a wall hanging out of the other. Come by the shop to see both soon. We also have coordinating fabrics. As the year goes on, watch for these to arrive for summer, fall, and winter. 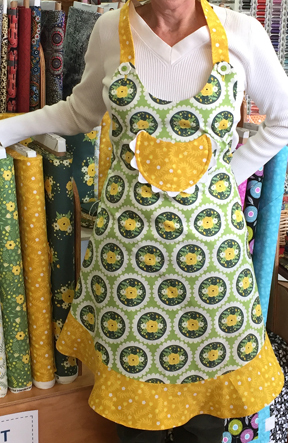 This darling apron features an adjustable neck strap to fit cooks of all heights, and the “ruffle” around the bottom isn’t really a ruffle at all. Learn new skills making this project in one day. Judith Swain made the shop sample and will be your teacher. Do you have yarn in your stash that you’d like to use with a pattern, but it’s not the right weight? If so, you can learn to adjust patterns to match your yarn. 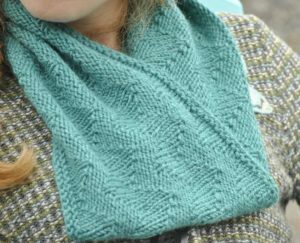 Knit this cowl after learning to modify the pattern so you can knit with any size yarn or needles, from lace weight to bulky. The ability to adjust patterns is a great skill to have. Anne Worthington will teach this class. 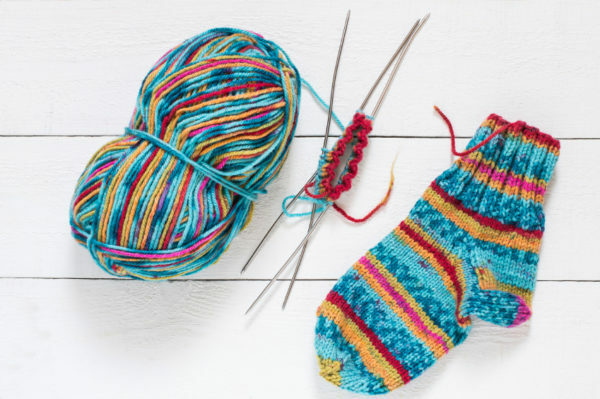 Learn how to knit socks by making one miniature sock using worsted weight yarn and larger needles. This is a great way to learn every step of sock making – leg, heel flap, gusset, and toe – in one class session. Then you’ll be on your way to making socks in any size using any yarn. Anne Worthington will teach this class. Interested in a career change? We have an opening. 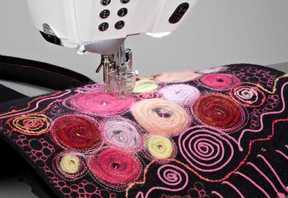 The job involves providing superior service to customers in both our yarn and quilt/fabric departments. Knitting and/or crocheting experience is required. Sewing and/or quilting experience is preferred. Retail experience is a plus. Computer skills are a must. The ideal candidate will: be happy, energetic, have a positive attitude, and enjoy people; learn quickly and have the ability to multi-task; be organized, self-directed, possess a strong work ethic, be confident and have the ability to listen well and communicate clearly; be respectful and committed to the success of our business. 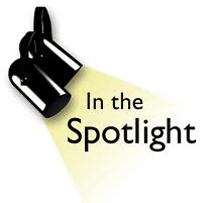 This position is full-time (32-40 hours per week) including some Saturdays and occasional evenings. Benefits include paid time off, a bonus program, employee discounts, and a pleasant work environment. If you meet the qualifications and are interested in being considered for this position, please click here to download an application and then either deliver or mail it to Cortez Quilt Company & Yarn Shop, 40 West Main Street, Cortez, CO, 81321. We are open Monday-Saturday from 9 a.m. until 6 p.m. No phone calls, please. If you have applied in the past we have your resume on file so there is no need to re-apply. Thanks! Join Cindy and Ann for Embroidery Make & Take this month and make a zippered pouch completely “in the hoop.” That’s right . 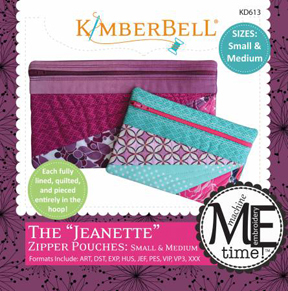 . . you’ll even insert a zipper using your embroidery machine. How cool is that? All supplies and your pattern are included. Sign up today! This is a first. We found a pair of shoes under a classroom table after our sale week before last. This might be related to changing in and out of snow boots. If you're missing a pair of shoes, call or come by to identify and claim. Thanks! 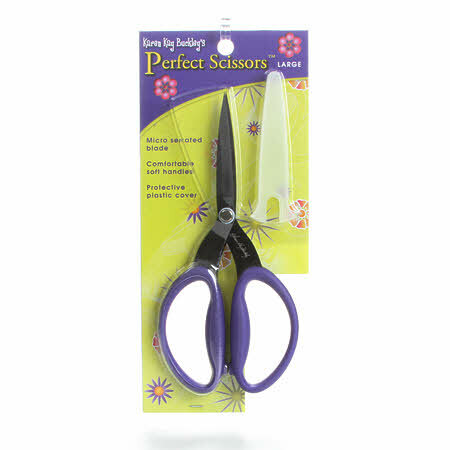 This week only, save 20% on Karen Kay Buckley's Perfect Scissors. They come in three sizes and have a micro-serrated blade for precise cutting. We love these scissors! 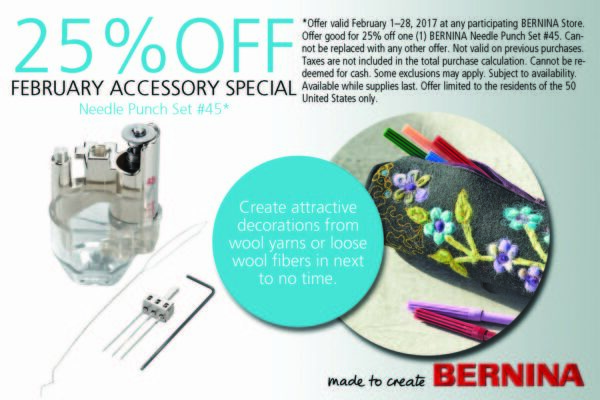 Offer expires on Saturday, February 11 at 6 p.m. Limited to stock on hand so come by soon. No phone orders. You MUST mention that you saw this offer in the Quiltzette to receive the discount.